Riverfest is the largest community event in Kansas, drawing more than 445,000 last year to downtown Wichita, and one of the most affordable and family-friendly events in the Midwest. For the price of a button ($5-$10), festival-goers can enjoy more than 100 events during nine days. Besides food and beverage, very few Riverfest activities incur an additional charge over the price of the button. The 2017 festival, June 2-10 in and around the Arkansas River, is packed full of concerts, fun for kids, athletic competitions, river events, performing and visual arts, cultural experiences and festival food. Looking at the schedule of events can be overwhelming for a first-timer or a veteran festival-goer. We’ve come up with a few suggested itineraries, whether you’re planning to experience Wichita’s Riverfest with kids, friends or your partner. 5-10:30 p.m.: Cox Kids’ Corner – Enjoy games, art and science projects, clowns, magicians and other surprises. Also near the kids’ corner, you’ll find paddle boats, inflatables and kiddie rides by Big Sky Party Rentals and horse rides by Hope in the Valley Equine Rescue. 5-10:30 p.m.: The Crate Escape – The Wichita Area Room Escape Society presents a timed escape game. 5-10 p.m.: Chroma Dance Party – Chroma is an exciting immersive concert experience for all ages featuring cutting edge audio, visuals, regional and touring DJs, and loads of paint! 6:30 p.m.: Safelite AutoGlass Sundown Parade – Thousands will line downtown Wichita streets to usher in the first big event of the 2017 Riverfest. Parade entrants inspired by this year’s theme, “River Madness!,” strut their creative stuff with floats, bands, flags, performers and all your favorite parade traditions. 6:30 p.m.: Hot Air Balloons Launch – These majestic and colorful icons of Riverfest will launch at 6:30 p.m. from south of RedGuard Stage, weather permitting, then glow at 8:30 p.m.
8:30-9:30 p.m.: Twilight Pops Concert featuring the Wichita Symphony Orchestra – The Wichita Symphony Orchestra, under the direction of Dr. Mark Laycock, performs popular favorites from the Kennedy Plaza Stage. For the finale, the orchestra will be joined by the 1st Battalion, 161st Field Artillery Regiment cannons and bells provided by the Bloomfield Carillion in performing Tchaikovsky’s 1812 Overture. Bring your radio for the live concert broadcast on KEYN 103.7. 10 p.m.: Textron Aviation Opening Night Fireworks – enjoy the breathtaking displays over downtown Wichita, choreographed to a unique musical arrangement. Bring your radio and tune to 103.7 KEYN for the live simulcast. Best viewing is along the Arkansas River from Lewis to First Street. 7-11:30 a.m.: 41st Kansas Health Foundation River Run – From the Tot Trot or 2-mile family fun walk to the 2-mile run or 10K, there’s a River Run activity for any pace and any age. For complete information, visit RiverRunWichita.com. 7-11:30 a.m.: Admirals’ Pancake Feed – Past Admirals serve up piping hot pancakes, sausage, juice and coffee for only $8 per person. 11 a.m.-4 p.m.: Wings of the Wind Kite Festival – Up, up and away! This fun-filled family event is sure to keep all eyes on the skies. 11 a.m.-10:30 p.m.: Cox Kids’ Corner – This area is available every day of the festival, with special additions on various days. Today’s special is a toy train display from 11 a.m.-5 p.m., along with the games, art and science projects, clowns, magicians and other surprises. Also near the kids’ corner, you’ll find paddle boats, inflatables and kiddie rides by Big Sky Party Rentals and horse rides by Hope in the Valley Equine Rescue. 11 a.m.-1 p.m.: Tennis Fun Day – Whether you love tennis or have never walked onto a court, you&apos;ll have a great time as local pros and players lead fun tennis games and activities for all ages at Ralph Wulz Riverside Tennis Center. There will be light refreshments and other fun activities for the family. Bring your racket if you have one. For those who don&apos;t, kids racket will be available to use. The first 100 kids, 10 and younger, will receive a free tennis racket! 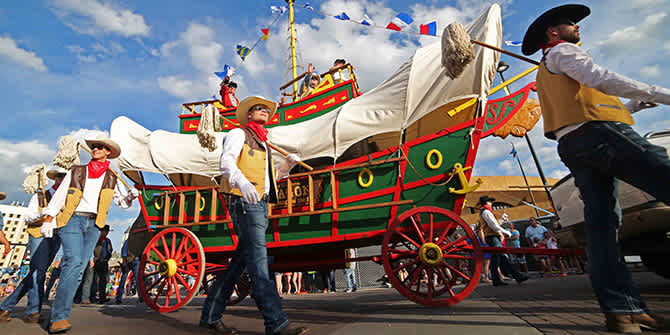 Noon-8 p.m.: Wagonmasters River Tour – All ages will enjoy the mostly true tales spun by Wagonmasters as they guide a decked-out pontoon boat from the Douglas Street bridge to the Keeper of the Plains and back. It’s a fun 20-minute tour with great views. Click here to see Riverfest’s full list of family activities. Riverfest offers lots of options for couples wanting to head downtown for a date night: enjoy the once-a-year smorgasbord of festival food at the Century II Food Court, catch a concert by a national act or lounge in a riverside park transformed into a backyard playground with adult beverages. Find one of the concerts that fits your taste in music – there’s something for everyone and all shows are included in your admission button. Click here to read our blog post highlighting the concert schedule. Bring a blanket and enjoy a meal from the Century II Food Court or Red Guard Stage Food Court during the concert or splurge for VIP passes. The VIP experience will only set you back an extra $25 and you’ll get access to exclusive viewing areas, a private cash bar and private restrooms. VIP experiences are available for the following concerts: The Flaming Lips, 5:30 p.m., Saturday, June 3; LoCash, 5:30 p.m., Sunday, June 4; Mavis Staples, 6:30 p.m., Thursday, June 8; Common, 6:30 p.m., Friday, June 9; and OK Go, 6:30 p.m., Saturday, June 10. Imagine yourself relaxing with an adult beverage amid the colorful designs created by Riverfest Artist-in-Residence James Marshall, aka Dalek. Kick back and enjoy the groove of local DJs, play oversized games like Jenga, take selfies with props like the giant Admiral’s chair or snap photos of each other at cutouts created by local artists. You’ll find this atmosphere at Ackerman’s Backyard, in A. Price Woodard Park between Century II and the river. It’s open each day of the festival. Whether it’s chicken on a stick, fresh limeade, ice cream, funnel cake or anything you can imagine battered and fried, Wichita’s Riverfest delivers the best festival food at two food courts. You’ll also find a handful of bar areas within the Riverfest gates, many serving specialty cocktails and local craft beers. For a special meal, come to the Goodwill Cajun Food Fest from 5-8:30 p.m. on Thursday, June 8 at the Kennedy Plaza. For $10, which supports Goodwill job training and education programs, diners will enjoy a generous helping of traditional Louisiana favorites including chicken etouffee, red beans and sausage served over rice and homemade bread pudding topped with a decadent bourbon custard sauce. Closing day is a perfect time to organize a girlfriend trip to Riverfest. Ride your bikes downtown to participate in the one-hour, guided I Bike ICT Tours: Murals & Public Art at 11 a.m. Then leave your bikes at the Bike Valet at Ackerman’s Backyard and go enjoy lunch at one of the food courts. After lunch, shop inside Century II exhibition hall at the first Riverfest Craftapalooza Vintage Market. This one-day indoor market offers vintage-inspired wares, antiques and handcrafted items at booths manned by artisans, makers, upcyclers, junkers, upscale crafters and curators of eclectic treasures. Before pedaling home, take advantage of the chance to get out on the Arkansas River via the Wagonmasters River Tour or paddle boats. On land and on water, Riverfest has plenty of athletic events. Sign up for canoe, kayak or stock tank races on the Arkansas River. Get a team together to compete in dodgeball, human foosball or softball tournaments. Click here to view the list of athletic participatory events available at this year’s Riverfest with information on how to register. Looking for something less physical to compete in? Sign up for a eating contest – wings, ice cream sandwiches, funnel cakes – or the Riverfest Beard & Mustache Contest. Click here for a full list of Riverfest contests. Gearheads will also want to attend the festival. The Ford Pavilion and Dyno Drag is open daily in Kennedy Plaza featuring the latest in driving technology from Ford. Push it to the limit at the wheel of a Mustang at speeds up to 110 miles per hour on the Dyno Drag. Or, test your skill on the Xbox system offering an exhilarating simulated driving experience. Sign up for the T-shirt and prize giveaways, while they last. Included in your Riverfest button is one of Wichita’s top national car and motorcycle events. On June 9-10, the Blacktop Nationals will bring hundreds of classic cars, motorcycles and other vehicles to the air-conditioned Century II Convention, Exhibition, and Expo halls. We’ve done our best to verify dates and times of Riverfest events, however it’s always best to check WichitaRiverfest.com for the most updated concert and event information.